Here's another picture from the Picture of the Moment archive that I have yet to include in an entry. danlmarmot took it in January, when he, cpratt, and sinnabor -- who refers to my loss of karaoke virginity (to "Y.M.C.A. ", remember!) 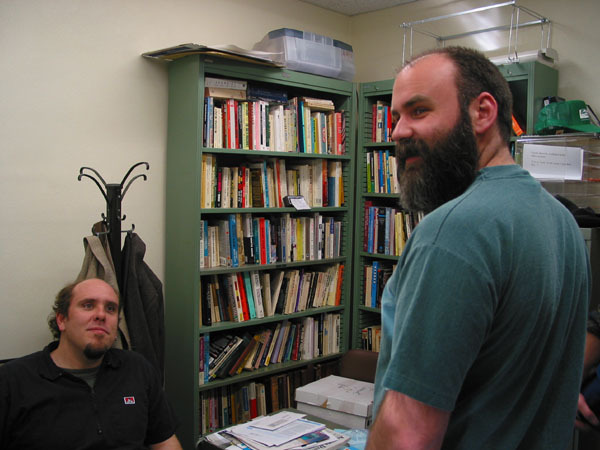 in his account of Spring Thaw, which coincided with the EMP conference -- all stopped by my office for a brief visit. This is my reality. Believe it or not, I can actually identify a number of the books on the shelf in the background. I'm a bit disoriented by the office pic and it troubles me. Location of the photographer, for instance, angles. I might see Bourdieu on a top shelf, or I might not. Or I might see my bookshelves in your bookshelves, misidentify. I am not at all surprised you can identify your books from spines. The jacaranda trees are starting to bloom here and when I first learned of them I had been reading the spines of your books, had felt my spine bent by the weight of a final semester of books. My spine did not break and will not. Beware the narratives of loss but since you're singing now there's perhaps a future there. I'm shades of terrible. I love it. Yes, isn't the angle just grand. so hard to achieve, especially with the vertical distance between Chris and myself. Maybe I will sing again. I applaud the passion. It suits your style.